January has been a month full of hosting out-of-town baby showers. First was the Big Top Baby Shower for one of my best friends. This past weekend I co-hosted a “sprinkle” in Houston for my sister-in-law, full of clouds, raindrops, and umbrellas. We used a color palette of blues, grey, silver and white. 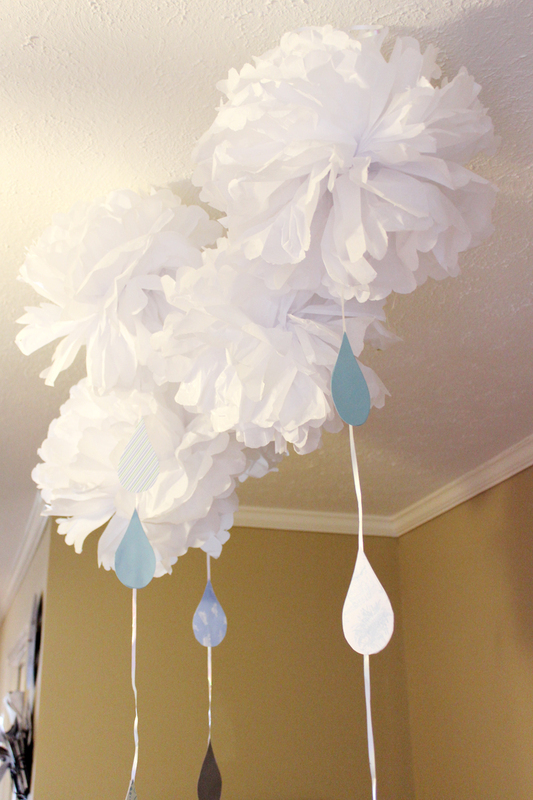 I made clouds out of white tissue paper and raindrops from different blue and silver paper scraps. 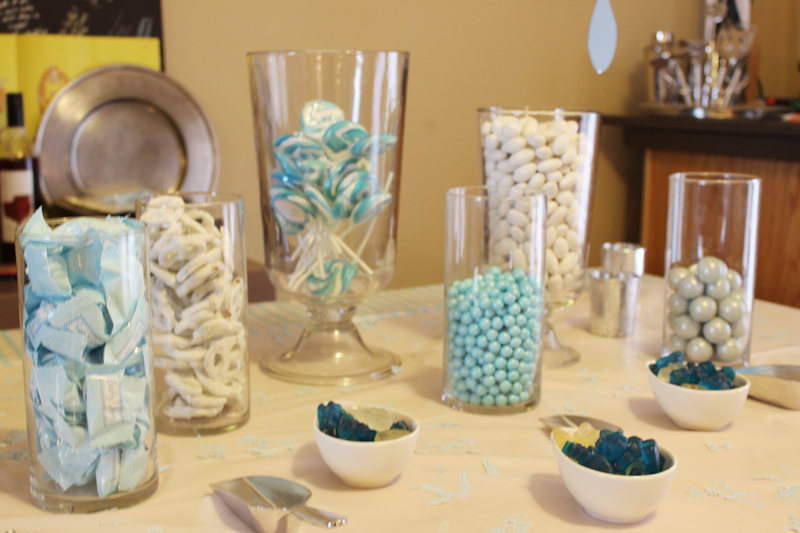 My co-host created a candy bar as favors for the guests. 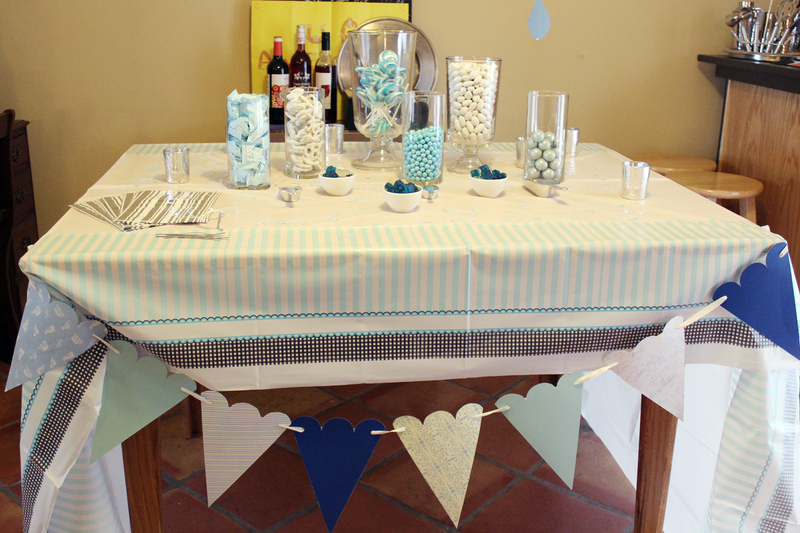 I loved the bunting for the circus shower, so I used it as a template for a banner for this shower too, using paper that matched the raindrops. 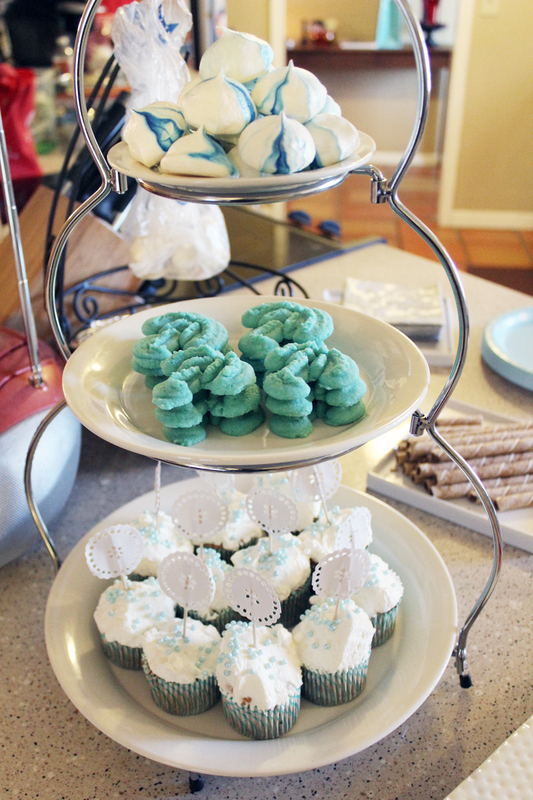 I put together a tower of blue foods including marbled meringues, umbrella shaped spritz cookies, and cloudlike angel food cupcakes. The biggest hit of the shower may have been a caramel-toffee fruit dip made by my co-host. 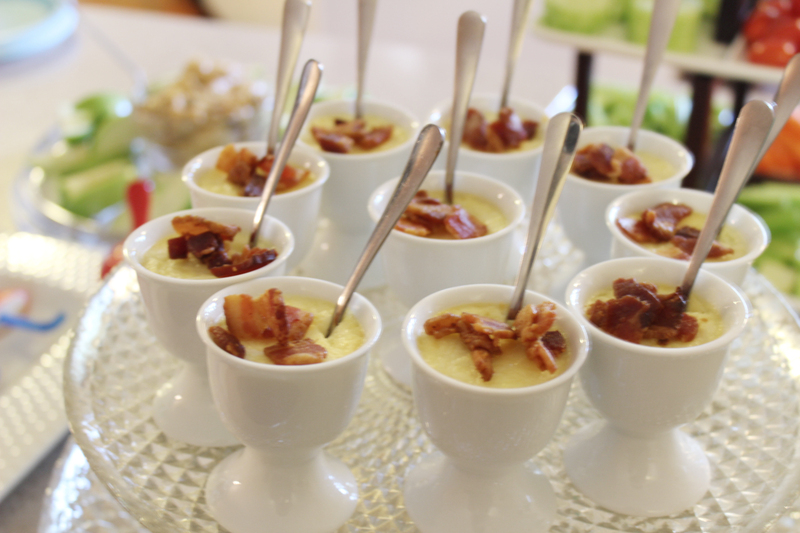 For savory treats I made Parmesan custard in egg cups, babybel cheese umbrellas, and spinach artichoke phyllo cups (not pictured). 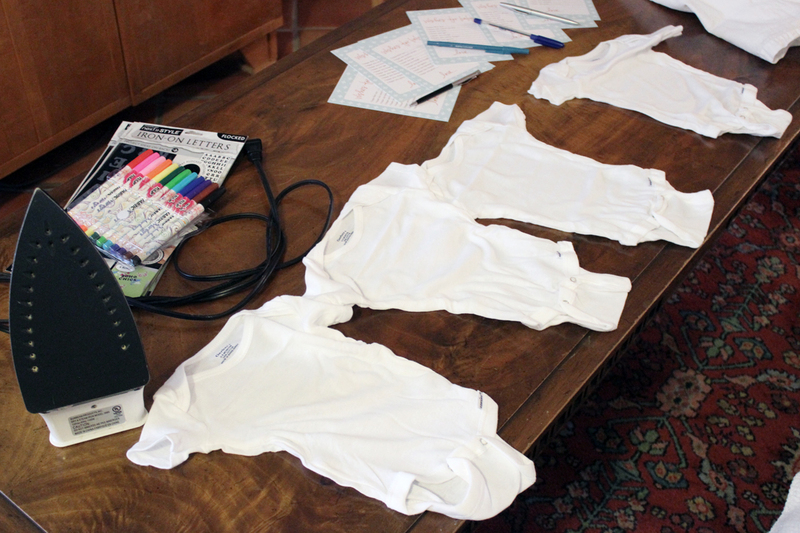 Rather than playing baby shower games we supplied the guests with onesies, fabric markers, and iron-ons to decorate onesies for my new nephew. I wish I had taken pictures of some of the decorated onesies. If you’re hosting a baby shower, consider theming it around the nursery decor so that party decorations can be sent home with the mom to use in the baby’s room. You are so creative! 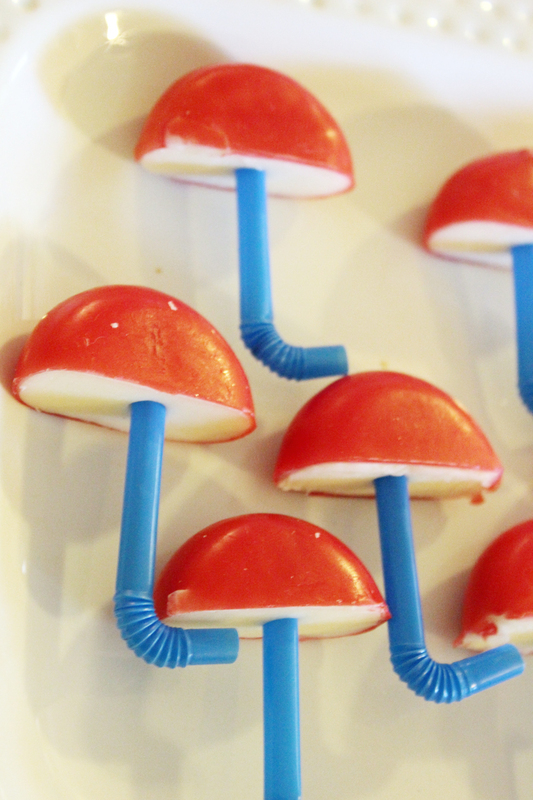 Those babybel cheese umbrellas are too cute, and I love the sweets’ color coordination! An adorable theme! The clouds and raindrops really make the space feel special, and the cheese umbrellas are the cutest. Well done!